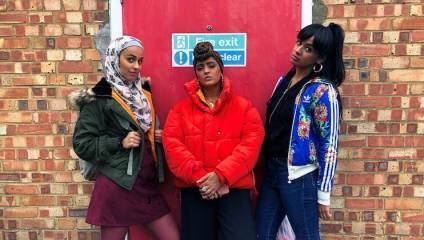 In Hounslow Diaries, three young Muslim women make it their mission to get into the VIP bar at a West End club: if Shaheeda can keep a lid on Tash’s kleptomania and Leonie’s nerves, they might just have the best night out ever... The new TV comedy is based on a play written by Ambreen Razia, who stars as Shaheeda. We caught up with her ahead of the show's debut on BBC Three. Culture Calling: So, are you actually from Hounslow? Ambreen Razia: No I’m not! [laughs] No I just heard someone say “Hounslow Girl” when I was in college, so that’s where the idea came from. I was like “what is that?” and basically it’s a girl in a hijab who talks a bit street, uses slang… It’s like an Essex Girl or a Chelsea Girl. CC: What’s the show about? AR: It’s a comedy about Shaheeda, Tash and Leonie who are three Muslim girls growing up in West London. This [pilot] episode is about Shaheeda trying to get them into a West End nightclub, but obviously it’s not as simple as it sounds. CC: It’s a refreshing portrayal of young Muslim women, don’t you think? AR: Definitely. I think a lot of Muslim narratives can be quite politically driven, or sometimes quite sinister, particularly with women often presented as passive and victims. I think it’s really good to get a balance – and to have the comedy as well! It’s good to see three young, free-spirited Muslim girls causing mayhem and just being young. And it’s important Muslims aren’t all tarnished with one brush and people don’t just get one stereotypical version. CC: The show has a lot of fun with the girls’ cultural background but manages not to feel exploitative. Was it tricky to get the balance right? AR: I think if something comes from truth and it’s based on fact – it’s literally verbatim things you’ve seen – then you can’t go wrong. It’s based on the girls I went to school with, and that is how they speak. And it’s also based on the young Muslim women I teach because obviously I went to school ten years ago, so I’m lucky that I can tune into how they talk and what kind of slang they use. It just comes from what I’ve seen. CC: Where do you teach? AR: I did it more before I was acting and writing, and I still do occasionally, but I used to work for a company called Arc Theatre with young women between the ages of 12 and 16. We would tackle issues that affected them like body image, domestic violence, girls in gangs, self-harm, stuff like that. I was able to speak to a lot of female ex-gang members and that inspired my second play, Pot. After that I started working with young Muslim women around Prevent, so I was always around young women, and they were so funny, and I was able to just pick stuff up. CC: Those are quite serious topics – can we expect to see some of those heavier themes cropping up? AR: I feel that stuff is better explored in my other work. This is for a younger audience, and it’s enough to see three young Muslim girls causing havoc and making lots of mistakes. You hope that even just one girl at home will think “oh, it’s ok – I’m doing the same thing and don’t need to feel guilty”. CC: Who are you hoping the show will appeal to? AR: Obviously I want it to appeal to everyone, but hopefully it will really resonate with young women. A lot of my work has been with young women so it is a group of people who are close to my heart. CC: Most of the production crew were women; what did that add? AR: Charlie, our producer, was the real advocate for that and made sure we had as many female crew members as possible. Representation for women on screen is one thing, but then behind the scenes there’s also a lack of opportunities for women. At the end of the day, it’s a female-driven narrative, so why not have a female crew as well? It’s cool! CC: The show is based on your play Diary of a Hounslow Girl – has a lot changed? AR: The play is a comedy drama really, there’s a lot of drama in it and serious issues like the ones I mentioned – teenage pregnancy, drug abuse, peer pressure… but when you’re moving something into a different realm there are sacrifices that have to be made. At the end of the day, it was a comedy commission. Don’t get me wrong, it was scary to strip the drama out of it, because you think that that’s the only thing that’s going to make a piece of work really rich and potent. But actually, working with a production company of women who shared the same activism as me, in terms of wanting to represent young Muslim women properly, we found drama in other ways. The characters are perfect – they’re a bit ugly, a bit gritty, they’re a bit sad. You can find drama through comedy, if you know what I mean? CC: The show airs on Monday 5th November – what's next? AR: Fingers crossed it becomes a series, and I can start writing that! I’ve also got some acting work, and I’m developing my third play Keeper with the Bush Theatre. My play Pot just finished its national tour round the country. I’ll be honest though, I would love a holiday! Next year is going to be full on. Me and [Hounslow Diaries co-star] Mandeep Dhillon, we’re currently developing something together at the moment for Channel 4, so lots of bits and bobs coming up! Hounslow Diaries is available to watch from Monday 5th November on BBC Three.